Who needs a good memory when you have the internet? I often wonder how my memory would differ if I hadn't grown up with that world wide reference tool at my disposable (now on my body at all times). Would I create techniques to better recall all those what's-it's-names and what's-that-dates? This kind of curiosity inspired American journalist Joshua Foer to undergo memory training, learning ancient and largely forgotten techniques that would have be used, for instance, by medieval scholars to memorize entire books. After a year of training, Foer found himself qualifying for the finals of the U.S. Memory Championship. His book Moonwalking with Einstein: The Art and Science of Remembering Everything relates his experiences in the world of competitive memorizers. The book also provides a cultural history of memory. 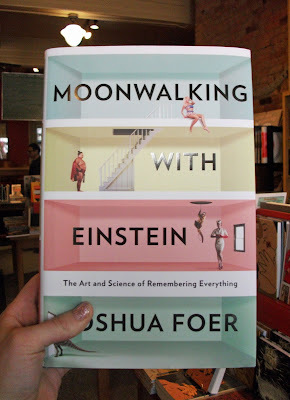 When we unpacked this book from a box of new arrivals, I remembered having recently listened to an interview with Foer. I knew where I was when I heard it—my bedroom, on a sunny day—but I couldn't recall which podcast it was from or much of the content. I remembered finding it very interesting at the time. Thanks to Google ("Joshua Foer + podcast"), I've solved that little puzzle and have some suggested listening for you—the New York Times Book Review podcast of March 11th.